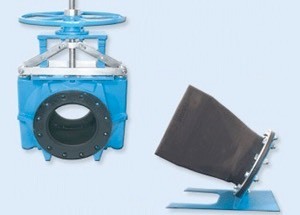 General Rubber's Flex-Valve® line of pinch valves are uniquely suited for slurries and other difficult fluids, and can outperform alternative products ten to one. They are abrasion and corrosion resistant, non-clogging, maintenance free, and can even seal drop tightly around solids. Flex-Valve® is a brand under General Rubber Corp., representing their state of the art line of pinch valves, pressure isolation rings, and duck bill check valves.